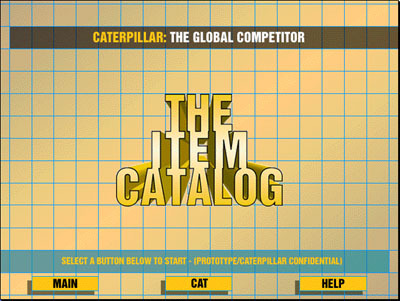 “The Item Catalog” for Caterpillar, Inc.
Caterpillar, Inc. desired to explore moving a portion of their extensive parts catalog from a paper only, to an interactive CD-ROM computer-based solution back in the early 1990’s. 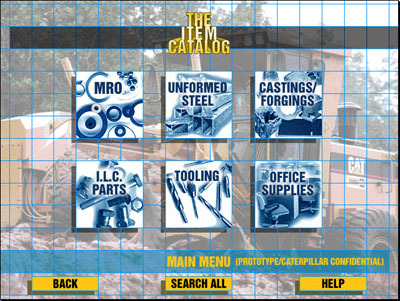 Randal Birkey worked with Lou Morelli in producing an interactive CD-ROM demo for Caterpillar, Inc. to evaluate. The graphics were done in Adobe Illustrator and Photoshop, then moved into Macromedia Director for sequencing and interactivity programming. Morelli provided the programming for the “hooks” into the parts database.